In order to properly assess the condition of sewer/drain lines, it is frequently necessary to clean the lines in question before a CCTV inspection is possible. BSI uses a high pressure water sewer jetting system to ensure proper cleaning before any visual inspection is conducted. 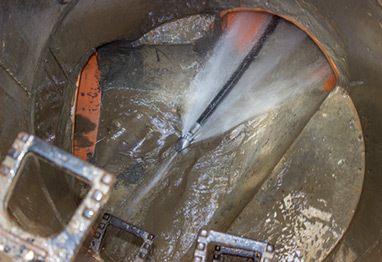 Nozzles are affixed to the end of a ½” diameter high pressure hose which is then snaked through sewer and drain lines to loosen debris and sediment within the pipe. Debris is then pulled downstream by retracting the pressure hose. If so desired, debris can be removed from the system at the manhole point of entry by vacuum extraction or allowed to flow downstream. BSI has the capacity to clean pipes from 4” to 36” in diameter. In addition, BSI is equipped with a detachable reel of hose ¼” in diameter and 200’ long, capable of operation up to 1500’ away from the system for hard to reach access points and building laterals.